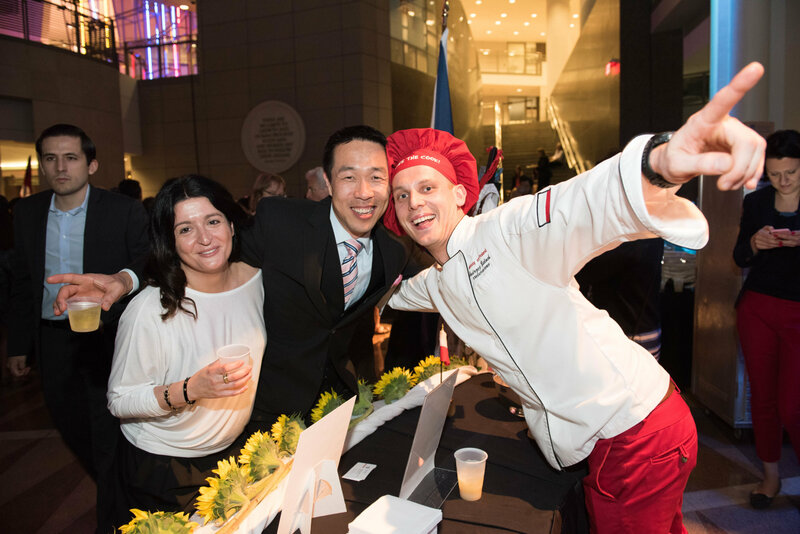 WASHINGTON — On May 17, chefs from 30 different embassies will meet at the Ronald Reagan Building and International Trade Center in downtown D.C. for an event that showcases food from around the world. And Wenford Patrick Simpson has one piece of advice for everyone cooking: “(They need to) have a lot of napkins and a lot of paper towels so they can wipe tears away,” said Simpson, a chef-ambassador from Jamaica. Culinary diplomacy is the crux of the Embassy Chef Challenge, which is now in its tenth year. But the event is also just as the name suggests — a challenge. Each chef prepares a dish (or two) and competes in a number of categories. Attendees and a panel of judges are responsible for the voting. Music, dancing and beverages — from cocktails to coffee — are also part of the evening. Greg O’Dell, president and chief executive officer of Events DC, said the “aromas and presentations” at all of the tables instantly pique attendees’ interests. And after a few bites, a more open dialogue ensues. “We think people are coming together, learning about different cultures,” O’Dell said. Simpson’s “rain” will come in the form of a five-cheese macaroni and cheese, paired alongside a secret dish that he’s not willing to reveal just yet. Instead, he offers a hint: “The event is next week, my meat is already marinating as we speak,” he said in an interview on May 10. Simpson is also planning on making a jerk shrimp, served with a watermelon and arugula salad. “Jamaica is all about spice and it’s all about flavor and so forth, and that’s what I’m going to bring to the table,” he added. This year is chef Sinali Anzata’s first at the competition, where she will represent the rich and diverse culture of Côte d’Ivoire on a plate. Guests can expect attiéké, a classic side made from ground, fermented cassava (a type of starchy root from a tropical tree). The end product resembles a small grain, like a couscous. With it, she’ll serve lamb and a grilled red snapper. Anzata, who said she wants everyone there “to travel through food” will also distribute homemade ginger juice, plantains and coffee — which she said is the best in Africa. Sweets fans won’t be left out at the Embassy Chef Challenge. Chef Dries Molkens from the Embassy of Belgium has dessert covered. “A big part of it is chocolate, as expected probably,” Molkens said. Only his dish will highlight white chocolate, in part because “people are not sure if it’s real or not and if it’s nice or not,” he said. Rhubarb and strawberries will also play prominent roles in the dessert. “Rhubarb is very famous in Belgium. In summer, most people have it in their garden, and strawberries, I don’t think there’s any better fruit in summer than that,” Molkens said. Tickets to the event are $90 ($175 for VIP), and admission includes all of the food, drinks and entertainment for the evening. Jamaica’s Simpson talks a big game, but the chef said he’s looking forward to taking a break from his table and checking out a few foods he’s likely never had before. And with international affairs always top of mind, he said it’s also a great chance to leave political differences at the door and bond over one thing everyone has in common: food. “This is good, to see so many embassies come together and we can just put all of that aside and we can all just come together and just have fun and just enjoy the event, and I think this is what it’s all about,” he said.